15-Minute Parking Space: Motion by Councilor R. Elliott (3/20/18) “Request City Manager Explore Feasibility of Providing 15 Minute Parking Space at 56 Branch Street. A sixty-day trial will take place. If at the conclusion of the 60 days, the Police Department and the Engineering Department concur the trial to be successful, a permanent 15-minute parking space will be implemented. Loading Zone Parking Space: Motion by Councilor R. Elliott (3/20/18) “Request City Manager Explore Feasibility of Providing a Loading Zone Parking Space at 32 Branch Street.” The response was prepared by Jim Donison, DPW Commissioner. He wrote, “It is not recommended that a loading zone parking space be approved at this location. There already exists a 15 minute dedicated parking space in the immediate area. In addition, there is a restricted parked area in the immediate area across from the City Fire Station which further restricts parking on this side of the street. Broadcasting from Mayor’s Reception Room (MRR): Motion by Councilor E. Kennedy “Request that Lowell Television Corporation (LTC) Consider Installing the Apparatus Necessary to Televise Sub-Committee Meetings and Other Appropriate Events in the Mayor’s Reception Room (MRR).” The response was prepared by Mirán Fernandez, Chief Information Officer. It will cost approximately $170,000 for the equipment and about $70,000 for routine broadcasts from the MRR. Funding will need to be identified and the contract with LTC will need to be modified if the City Council wishes to pursue this project. The Motion Response agenda also contains “Lowell Police Dept. Training.” A written response is not attached but last week City Manager Donoghue did state that the Superintendent of Police, William Taylor, will be present at this week’s meeting to answer the motions on this subject. Councilor John Leahy: Request City Manager Initiate a Program to Involve Community/Business Members to Assist In Beautifying the City. 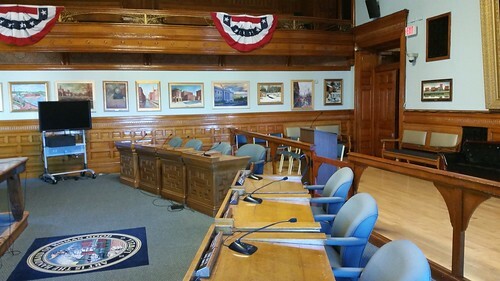 Councilor John Leahy: Request City Manager Invite Comcast, Verizon and National Grid to a Meeting to Discuss Double Poles and Hanging Wires Present Throughout the City. Councilor John Leahy: Request City Manager Work with DPW to Develop Best Practices for Inventory Control as it Pertains to Land and Buildings in the City. Councilor Rita Mercier: Request City Manager Have Proper Department Remove the Barrel from North Llewellyn Street and Fill the Whole or Make Necessary Repairs. Councilor Rita Mercier: Request City Manager Find Ways and Means to Have Street Light Installed on Pole #41 on East Merrimack Street at Geana Lane. Councilor Vesna Nuon: Request City Manager Have Law Department Draft an Ordinance Which Would Require City Bid Construction/Development Projects of a Certain Size Which May Involve TIF’s and Within the Hamilton Canal Innovative District Adhere to Minimum Work Force Standards for the Employment of Minorities and Women Which Mirror Current State/Federal Requirements. Councilor Vesna Nuon: Request City Manager Develop a Recording, Reporting and Accountability Process With Regular Public Meetings Among Stake Holders Pre, Through Post Construction for Construction Workforce Diversity Data on Projects Covered by Prior Proposed Ordinance. Councilor Vesna Nuon: Request City Manager Direct Proper Department (DPD, Neighborhood Services, LRTA) to Organize a Public Information Session to Inform Residents About Changes to Bus Routes and Bus Stop Locations Resulting from Temporary Closures and Repairs of Canal Bridges. Councilor David Conway: Request City Manager Report on the Status of the Crossing Light at Douglas Road and Andover Street. Councilor David Conway: Request City Manager Provide Update on Road Construction at The VFW Highway Across the Street from Top Donut and the Aiken Street Bridge. Mayor Bill Samaras : Request City Manager Have DPW Look Into Repaving the Playground at the Rogers School. I am thankful to City Councilor Kennedy for requesting LTC to cover Sub-Committee meetings. It is a good way for the voters to know what is happening in the city. Also thankful for Councilor Noun for requesting hiring of a firm that promotes diversity in staffing of the Hamilton Canal project. Councilor Conway thank you for staying on the lights on Andover Street and Douglas road.